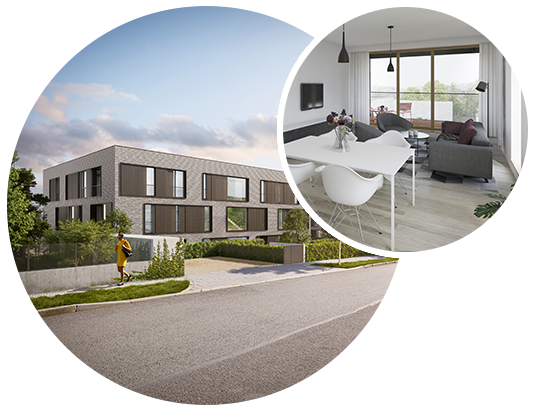 Four new apartment buildings will rise on the southern slopes of Brno’s most desirable neighbourhood. If you’re looking for a peaceful home that’s just a short hop to the city centre – these 47 new apartments in Neumann Street, covering an extensive 4,430 m2 plot, represent a smart investment opportunity. The surrounding villas of the Masarykova čtvrť residential area transport you back to functionalist Brno in the First Czechoslovak Republic. Nature and green spaces are close by, just follow the nearby cycle path and Wilson Forest is just 800 metres away. Access the city centre in just a few minutes by car or public transport. Thanks to the tunnel in Pisárky, it takes approximately the same time to reach the D1 motorway. Within a 1 km radius, you’ll find a kindergarten and primary school, grocery shops, pharmacy, doctors, post office and restaurants. Neumanka is cleverly hidden within the sloping terrain. Although there are only three storeys facing the street, three more floors exist below street level. The entire project fully respects the neighbouring buildings. Did you know the apartments are built using modern Kalksandstein sand-lime bricks?